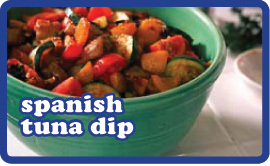 A gorgeous Spanish kind of ratatouille with Tuna. It’s great as part of a tapas, or just as good as a starter on it’s own with some fresh toasted bread. If you can get good quality Spanish “Bonito” then all the better, but ordinary tuna will do if Asda are fresh out of quality Spanish produce. Gently fry the onions and capsicums in the oil in a large pan for 10-15 minutes until soft. Add the olives, capers, tomatoes and juice ,and tomato puree and simmer gently for 5 minutes. Stir in the vinegar, and then the tuna add a little salt & pepper to your taste and simmer for 2-3 more minutes before removing from the heat and leaving to cool. Place in a large bowl and cover then refridgerate overnight to let all the flavours meld. Remove from the fridge an hour before serving to bring to room temperature.